Molino di Ferro, a brand imported from Italy. You can read about them here. Corn meal is the basic ingredient in Polenta, the quintessential northern Italian peasant dish. To give this dish a more different look, I decided to mix spiral pasta with small shells, a double culinary twist. 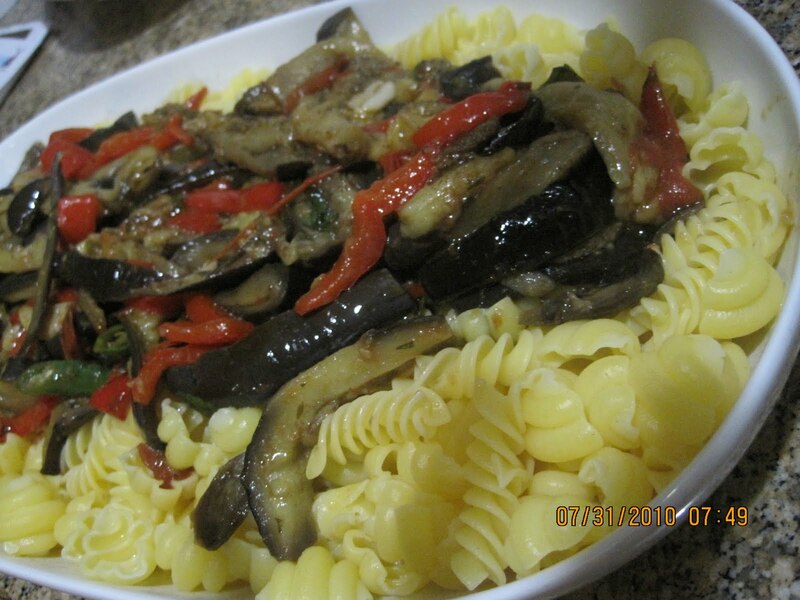 The eggplant is very easy to prepare. Toss all ingredients in a pan, season , cook over medium heat until tender. If you are using basil leaves, add those towards the end. Toss the vegetable mixture over the drained pasta. I was very surprised that the pasta tolerated boiling and remained al dente the way wheat pasta does. The flavors in this dish were very nicely accentuated by a a strong grated Romano cheese. A Pinot Noir completes the experience. Friends , when I think of corn, I usually thing of the endless corn fields of Iowa, ready to be transformed into ethanol or corn syrup. After this dish , I will really need to stop doing that.